pdf-Recover can be used to decrypt protected Adobe Acrobat PDF files, which have "master" password set. If you can not remember your password, pdf-Recover will allow to open encrypted files - and provide without any restrictions. pdf-Recover creates a 1:1 copy of your PDF-file without any password limitations, that means you can edit, copy and print texts and images of this document. 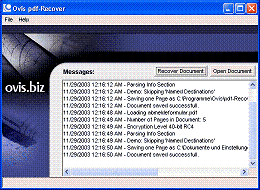 pdf-Recover will decrypt files up to 128-bit encryption. If you need some further features, please have a look at pdf-Recover Professional!